Text should be simple, direct, and large. Posters are a visual medium. Text should be at least 24 point in text, 36 for headings. Title should be at least 5cm tall. Minimize text and make it large!! 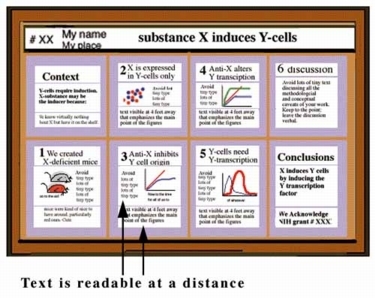 Helpful hint: If you print your poster on a standard sheet of paper, you should be able to read all of it - including text in figures - comfortably. If you can't, your text is too small.